Sometimes you have a character in mind before you start writing. At other times you have to create a character to fit a plot or live in a world you've already created. How do you go about it? A common suggestion -- even for children's book writers -- is to go through a prolonged period of character development that involves doing interviews and creating detailed dossiers. I can see some of this for young adult (YA) novels because of the length of the stories, but isn't that just overkill for an easy reader? I mean, the pulp fiction of the early 20th Century gave us some of the most-loved characters in all of fiction. Characters like Conan, Zorro, and Tarzan are still popular with readers, TV viewers, and moviegoers to this day. Those characters are well-made. They're constructed so that they meet our expectations... and then exceed them. This has always amazed me, given that these characters were created in the heyday of the pulps, which means these characters were created quickly. Think about it for a minute. Can you imagine a pulp writer, desperate to finish an 80,000 word serial in order to get the rent money, spending days to create a character? Can you imagine that writer spending hours “interviewing” a prospective character to learn about him? Or writing pages of detailed biographical information, just to be sure he understood what that character would do in every possible situation that might come up? Neither can I. Let’s be honest here; pulp fiction writers were avowed capitalists and, as much as they may have enjoyed writing and desired to create an outstanding piece of literature, they were in it for the money. If you can’t pay the bills, you can’t spend your time writing. And yet they managed to create these amazing characters -- not just one, but quite a few that have (in some cases) survived for a century. Doesn’t it make sense that these writers developed simple strategies for creating characters? Streamlined methods that allowed them to get a handle on the characters’ thoughts and actions quickly and effectively? Of course it does. We don't need to overthink our characters. Easy readers don't have a lot of time to get the story across, so the characters don't have to be drawn with the detail of an adult novel. The characters are relatively simple because the plots and worlds they live in are relatively simple. 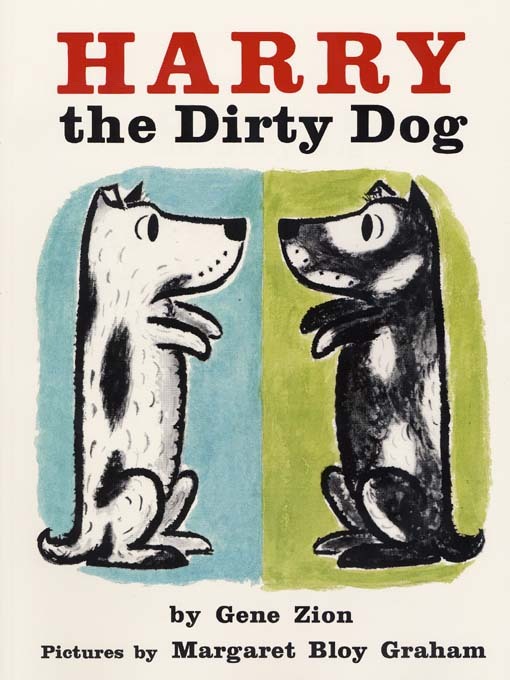 Harry the Dirty Dog is built around a simple character -- a white dog who doesn't like baths. The fact that he doesn't like baths drives the entire story. Everything that happens in the story grows out of that one trait. (Even the twist at the end.) And to make matters even simpler, he's white because white shows dirt more readily! How much simpler can the character be? The best characters in an easy reader are usually very simple. That way, they're easy for a child to understand. That doesn't mean they're easy to write, of course... Harry's adventures show a lot of thought on the writer's part. But it doesn't take ten pages to explain why he does what he does, either. So don't overthink your characters. If the basics of the character aren't easy to grasp in a sentence or two, you're probably making them too complicated for an easy reader. The cover shot is from this page at the Nebraska OverDrive Libraries. I guess every writer asks that question at one time or another. Judging from the books I've read, it's apparently the most-asked question that published authors hear. Some just say “Ideas are everywhere" and then give a bunch of examples. But that doesn't really answer the question, does it? Most of those listeners probably just interpret that answer as "I can't look there because he (or she) already used those ideas." I've also read some really funny answers. My favorite is “I get mine mail-order from an old alchemist near Stonehenge.” I don't remember where I read that one, but it stuck with me. I do remember the writer refusing to give the alchemist's address -- a trade secret, apparently. But sometimes I wonder if those evasive answers just mean that nobody really knows the answer. I mean, why is it so hard to answer such a simple question? Or are the writers just afraid that, if they probe the question too much, the ideas will start hiding from them? I think most writers believe storytelling is primarily a matter of inspiration. There’s something mystical about creating a story, and we can put a great deal of work into it and still fall flat on our faces. As a result, we figure there's some cosmic secret that you have to know in order to be successful. Don't get me wrong -- inspiration is a wonderful thing when you can get it. It's just that it often doesn't come along until late in the process. But I don't think it's such a hard question. Let me take a shot at answering it. Are you ready? AN IDEA IS NOT A STORY. Ideas are just building materials. Let’s compare creating a story to building a house. A house is built from many different materials assembled in different ways. You may use wood for the frame, cement for the foundation, bricks for the façade. Does it take just one piece of wood, one bag of cement, one brick? Of course not! You need truckloads of material to build a house. But it’s not just about quantity of materials. How long will the house stand if the frame is built from balsa wood, commonly used in model airplanes? Even a strong wood won’t stand for long if your house turns out to be an apartment building; you’ll need metal studs then. Answering these questions requires at least a basic understanding of how to build a story. Any writer can find ideas. They're laying around all over the place, like rocks on the ground. So it isn't ideas that most writers lack. They lack knowledge about how to assemble ideas, how to craft a story. That's what generates the inspiration to overcome a blank page. The last post I wrote, the post about story building blocks, is an example of the kind of knowledge you need. You probably have some vague idea for a story. Captain Nexus got started from a simple desire to write something like Star Trek or Star Wars. You can't get much more general than that. So the real question isn't "Where do you get your ideas?" but "What do you do with the ideas you have?" Once you know the right question, it's not so hard to answer. You won't even need an alchemist's address. The cartoon came from the Calvin and Hobbes wiki. There are lots of different ways to define a story. Depending on where you are in the storytelling process, one may be more useful than another. The other day I wrote about the basics of plotting. That's one way to look at your story. It helps you find the crucial moment in your story, and it can help you decide what kinds of action need to happen around it. But suppose you aren't that far along? Suppose you're still trying to come up with a story? Or suppose you have an idea but don't know what to do with it? You might think I’m leaving a lot of things out. I am. Things like genre, for instance. While a sci-fi story is somewhat different from a western (unless you're writing Firefly or Star Wars), I’m just looking at the things all good children's stories have in common regardless of the genre. You can't get much simpler than that, can you? It's just six little lines but all three building blocks are there. 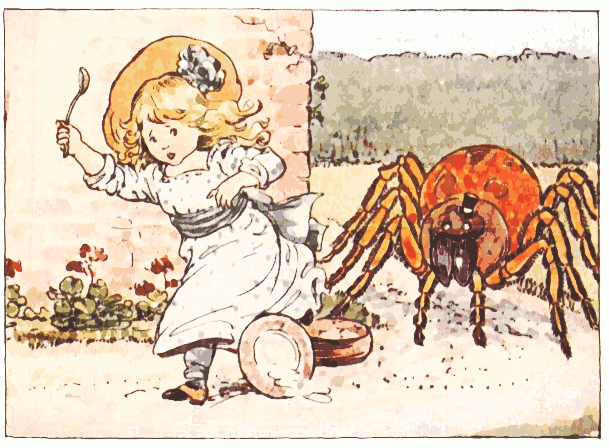 As you can see, we have characters: Little Miss Muffet and a spider. We have a world: We can see a tuffet (that’s a stool) large enough for two; curds and whey; presumably a bowl holding said curds and whey and a spoon for eating them; and a spiderweb, presumably near enough to said tuffet to make a neighborly visit practical. So if you feel lost when you start work on a story, stop and make sure you've got all the basic building blocks. You can't finish a jigsaw puzzle without all the pieces, and you need all the pieces of a story if you don't want to end up confused. The top picture is from librarysupport.net and the bottom picture is from wpclipart.com. How Old Is Your Hero? But you're seriously limiting yourself if you only write "child situations." Even those writers who recommend focusing on child heroes often say the hero should be 2 to 4 years older than your target reader. The reason older heroes appeal to them is simple. Whether we want to admit it or not, whether we like it or not, children are anxious to grow up. Watch children at play. When they create imaginary worlds, do they people them with young children? Of course not! They pretend to be adults. They explore alien galaxies and go on safari to hunt wild animals. I clearly remember a rainy day when I was young. My parents moved the car off our carport so my cousins and I could play spy. We put on raincoats and held secret rendezvous on the basement steps. And yet it's clear that not all adult stories appeal to kids. What makes the difference? On one hand, the situation has to be both simple enough for a child to grasp easily and yet active enough to keep a child interested There's a reason why Calvin (from the Calvin and Hobbes comic strip) chose to fight bug-eyed aliens from Zartron-9 rather than exploring the ecological effects of mineral fungus on the same planet. But I think it ultimately comes down to the story's hero. No matter what the hero's age or situation, there has to be something about him or her to which a child can easily relate. In Calvin's case, I suspect a small guy like him feels that he's constantly fighting against stronger creatures -- and not all of them friendly. The hero of his daydreams, Spaceman Spiff, frequently comes out on top against impossible odds. And let's face it, Spiff is cool. Faces the same type of problem as my readers. As with Spiff, just because they don't live their daily lives in a galaxy far, far away doesn't mean they don't face the same kind of problems. There's more than one way to face overwhelming odds. And just because it's not overwhelming to an adult doesn't mean it's not overwhelming to a child. There's often a way to "childsize" an adult problem so the child can relate to the adult who plays the hero. Can find a way to come out on top. Most writing instructors will stress that the character should solve the problem themselves, not be rescued by someone else. That's true... but let's not forget that, whatever else happens, the hero needs to solve the problem. The hero has to win. Period. Is appealing to the reader. No boring heroes, folks. Kids should want to be the heroes in our books. Make that hero someone cool! There's nothing wrong with having child heroes in your books. I just don't think you should limit yourself that way. An adult hero might be just what that young reader needs. There are a million budding Spaceman Spiffs out there. Don't be afraid to write for them. The image came from this page at ComicVine. My second book, Prince Jonathan's War: A Bible Story, is out! Like the others, it's for kids reading at level 2-3. It's a retelling of the story from 1 Samuel 13:15-14:23. In case you're unfamiliar with the story, Prince Jonathan is the son of King Saul. (He was the king just before King David.) Saul had just disobeyed the Lord and been scolded by Samuel, the "big" prophet in Israel at the time. Maybe Saul was still moping because of it, but in any case he was unwilling to lead his army against the Philistines who had overrun the land. In fairness, perhaps the fact that the army had only two swords had something to do with it as well! The Philistines had gotten rid of all the blacksmiths. That way it was less likely the Hebrews would try to fight back. As a result the army had only two swords -- Saul had one of them and Jonathan had the other. Everybody else had to use clubs, farm tools, or whatever they could get. Jonathan saw an opportunity to attack the Philistines, but knew his father wouldn't do it. So he took his sword and his armor bearer and the two of them went to fight the Philistines alone. It's one of my favorite Old Testament stories. Anyway, the book is available at Amazon for the Kindle and BN.com for the Nook, and at Smashwords in a variety of formats, all priced at $2.99. And, as I do with my other books, since the Smashwords-generated PDF won't be particularly attractive to a young reader, I have a special PDF version available here on site. The PDF is available on the World Lit page. One of the first questions a writer usually has is "How do I come up with a plot?" I would read stories, think that I could create something like that, and end up totally stumped about how to start. Just what is a plot, anyway? There are a lot of different answers to that question, depending on who you ask. I think every writer eventually comes up with his or her own definition of the term based on the kind of stories they write. For example, a novelist is going to have a different way of viewing plot than a picture book writer if for no other reason than novels are longer and more complex than picture books. That's part of the reason that discussions of "plot" seem so confusing. Everybody starts from a different place. So bear in mind that what I'm going to say about plot in this post is based on the kind of stories I write -- action-adventure tales that are slightly longer than most easy readers. It's an old truism that all stories have three parts -- a beginning, a middle, and an end. I think that's a good place to start simply because we can all agree on that. But -- pardon the pun -- if that were the whole story, the writing life would be a simple one. Here's something else that's pretty common. Most of us can come up with a beginning or an end. It's the middle where we get bogged down. So I think the real question is "how do I decide what happens in the middle?" When I started looking for an answer to that question I decided to look at short stories instead of novels. Since my books are shorter than most short stories, I figured I'd find more help there. I looked at flash fiction as well. Although most flash fiction focuses more on creating a mood than a plot, I found some useful stuff there too -- after all, flash fiction is about the length of most picture book and short easy reader texts. Mary Robinette Kowal's flash story Evil Robot Monkey (an adult flash story, not a kid's story) is a great example of just how much plot you can include in a short text. I finally found my key to plotting in Ben Nyberg's book One Great Way to Write Short Stories (Writer's Digest Books 1988). Nyberg gave a simple explanation of short story plotting that fit right into the "beginning, middle, end" idea. Here's the diagram, followed by an explanation. A normal day in the life of your character would start at point a (the beginning of the story) and finish at point b (the end of the story). It's a typical boring day. But stories shouldn't be boring. They should focus on an unusual day. So somewhere in the middle of the day your character needs to make a decision. He makes decisions everyday, decisions that let the day proceed normally (and boringly) from a to b. But not today. Today he's faced with a decision at point c and he says, "I've had enough!" And instead of making the decision that would send him to his normal destination at b, he makes a decision that sends him to an entirely new end-of-day at point d. The story is about how decision c changed his day. The middle in one of my plots is a decision. (The decision may come earlier or later during the story; the story determines the exact point.) The start of the day puts my character in a situation where he has to make a decision. There are a number of possible decisions he could make. Any decision that would result in "business as usual" gets thrown out of the story immediately. I pick a decision that will change his day from a normal one to an unusual one. In Harry the Dirty Dog by Gene Zion, Harry's supposed to take a bath (a normal day). Instead, Harry decides he doesn't want a bath today so he runs away (unusual day). The story tells about what happens to Harry because of the decision he made. In Evil Robot Monkey you can view the story as two decisions. Sly's decision not to put up with the kids today changes the course of his day. But you could also look at it as a story of Vern's decision. The way Vern chooses to deal with Sly's behavior has all sorts of consequences for both he and Sly. (Being an adult flash story, we only get hints of what might have happened at d.) This is a very sophisticated example, of course. The story is told from Sly's viewpoint but I think Vern's decision is more interesting -- an interesting choice by the author. Such a choice might be too advanced for an easy reader! Hopefully this gives you some idea of how to plot a story. There are other ways to do it, but a decision-oriented approach works well for action-adventure stories. When I decided to try writing easy reader books, my first move was to see what kind of instructional material I could find. 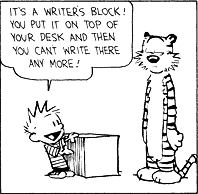 After all, there are lots and lots of books about writing for kids. At least that's what I thought. The truth was a little different. There are lots and lots of books about writing picture books. And there are lots and lots of books about writing young adult books. Easy reader and chapter books generally get a handful of pages in those books. And those pages generally give you a few simple guidelines and not much more. The most frequently given advice is to study some of the existing books and do the same sort of thing. I guess the most profitable areas for writers are the picture books and YA books. It makes sense that they would get the most attention. But it's not much help if you really want to write easy readers or chapter books. I'll try to pass on some of what I've learned about writing them in future posts. In this post I'd just like to tell you about my approach. The way I see it, there are two ways to get better at something. One is to study the nuts and bolts of what's involved, and the other is to just try doing it. Both are important. Let's say you want to get better at playing basketball. You'll end up spending some time practicing -- learning how to dribble, how to pass, and how to shoot. You'll focus on proper mechanics and learning the rules of the game. This can be a dreary part of the process, but it's important. But it's equally important to just get out there and play some basketball with friends. It's more fun, of course, and it doesn't feel like practice. But you learn a lot when you do it. You learn to tie all those things you practiced into a coherent whole, and you learn skills that you don't necessarily learn in practice. For example, you learn to anticipate where your teammates are going and how to match wits with your opponents. And most people can play for a lot longer than they can focus on practicing, which helps them get better in other ways. You learn to read the same way. Most easy readers are closely graded so youngsters can learn important vocabulary and sentence structure. They need graded readers. But if graded readers are all they get to read, it can be like practicing all the time. It's just as important to find books that aren't necessarily a challenge to read but are fun to read. When kids have books that they want to read, that allow them to just "play the game" for a while without worrying about learning new things, they get better at what they already know. They develop the ability to do it for longer periods of time without strain. And in the process, they gain a greater capacity to learn new words and read more complex sentences because reading gets easier and less like work. That's the approach I decided to take with my writing. There are plenty of graded readers out there. I'm trying to write books that are a little longer than the graded readers they use in school, but that focus on words they already know. I want the sentences to sound the way they really talk, so they feel more comfortable and natural. And I want them to feel that reading these fun books is fairly easy. If they feel more successful, hopefully they'll want to read more. And the more they "play," the better they'll get at reading. The better they get, the more they'll enjoy reading. And the more they enjoy it, the more they'll want to read. Of course, my books are "graded" as well. I don't want them to be too hard to read -- that would just make the kids give up too soon. But I'm not trying to push their reading levels as much as their comfort levels. I want them to get so good at reading that it's like play. So that's how I decided to approach easy readers. I want them to be fun. And that's shaped the way I write them. As I said, I'll get more into that in future posts. The first of my "first grade novels" is out! Most publishers say that kids don't read science fiction until around the 4th or 5th grade. My friend at the public library would disagree. Star Wars is incredibly popular with the young guys. In a similar way, I wanted to blend the idea of old movie serials with more modern serious SF (which can be written for this age group btw). So Captain Nexus is a blend of Buck Rogers and Flash Gordon, while I patterned Scopes after Doc Savage. This is my first attempt at a full-blown science fiction story, but according to the librarian who checks my books I "nailed" the reading level. And it still sounds "adult enough" that she said it might even work as a hi-lo book, which are what adult literacy classes use. The Krilt's Secret Weapon is available at Amazon for the Kindle, BN.com for the Nook, and at Smashwords in a variety of formats, all priced at $2.99. Mick's Place is Officially Launched! Well, as you can see, Mick's Place is now online. This is where I'll be announcing new books as they're available... as well as letting you know what a children's writer does for fun and maybe sharing some thoughts on what's happening in the world. For those of you who don't know who I am, my real name is Mike Southern. I write a blog called Ruthless Golf and I've published several golf books (and edited a book of swashbuckler novels as well). But I've always wanted to write children's books -- I still enjoy reading them! -- and with a little encouragement from our local children's librarian I've started doing just that. I'm writing what I like to call "first-grade novels." They're longer than regular easy readers -- typically between 2000 and 2500 words -- but not as long or complicated as chapter books. They have two or three "advanced" words in each book, but the vast majority of words are already in a first grader's vocabulary. And I try to make the books sound more adult -- no "See Spot run. Run, Spot, run!" My librarian friend checks each one to make sure the reading level is correct. They have chapters of 400 words or less, which is about the length of a short story for that age group. They have a couple of color illustrations in each chapter to help ease the transition between picture-heavy books and text-heavy books. And I try to mix humor and drama so the books are exciting but not overly intense. And as I write more books, you'll find both series books and standalone stories. To keep my children's books separate from my golf books and make them easier to find, I chose Mick Michaels as my pen name. When I was young, lots of my friends used to spell my name "Mick" instead of "Mike," so it just seemed natural. In the meantime you'll be able to find my books at Amazon for the Kindle, at BN.com for the Nook, and at Smashwords for a variety of formats. And I'll be offering my own PDF editions here on this site. The Smashwords-generated PDF is readable but it certainly isn't that attractive to a young reader. So welcome to Mick's Place. It's a work in progress but I hope you and your child will like it!